A relay card that can be used for e.g. switching polarity of track current. Can be driven from output X3 and X4 of the servo cards. Power supply should be 5 volt DC directly or can be taken from the decoder cards. Control input is TTL logic levels, 0 resp. 5 volt. Switched current is connected to Input 1 and 2 and they are connected to output 1/2. Depending on the state of the relay Input is connected to output, either as In1>Ut1 / In2>Ut2, or as In1>Ut2 / In2>Ut1. 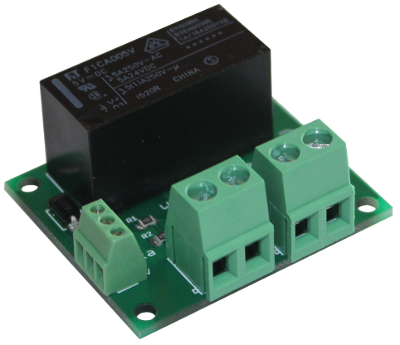 Relay is rated 5A (25VDC, 250VAC).